It seems that some airlines aren’t content leaving their customers in the hands of third-party apps like FlightTrack Pro and Flight Status Pro. 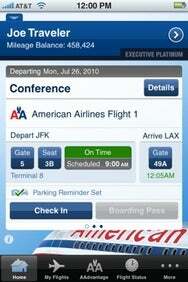 American Airlines has boarded the App Store with an official, feature-packed app for iPhone and iPod touch. American Airlines for iPhone can lend a hand through your entire trip: It can check your flight status, let you set a parking reminder by snapping a photo, check in for flights, store your mobile boarding pass, display terminal maps, and even let you enroll in and monitor your AAdvantage miles program. American Airlines isn’t the first airline to touch down in the App Store, though its only app-wielding U.S. competitor at the moment seems to be Southwest Airlines. American Airlines for iPhone and iPod touch is available now in the App Store for free, and it requires iOS 3.1.3 or later.